"Wilson, I hear your daughter's gonna marry Hilliard Comstock," the barkeep of Santa Rosa's fabled Senate saloon said to farmer Wilson Finley, according to family legend. "A great mistake, Wilson, they'll never make it - his family's too damn aristocratic." The 1918 marriage of the farmer's daugher and the man who became a Superior Court judge did indeed "make it;" Hilliard and Helen were wed for almost fifty years, and raised five children. The preservation of the 1905 Comstock House is mainly thanks to Mrs. Comstock, who made it her home for about 51 years, all told. Helen resisted the advice of "experts" over the decades who tried to convince her that the woodwork should be painted a nice clean white, and that the old place would be made brighter if the cathedral windows were replaced with clear glass. It was Helen who saved the house after the 1969 earthquakes toppled the south chimney and shook plaster off the walls, despite Santa Rosa's subsequent redevelopment fever that led to the demolition of so many other old and beautiful buildings. And it was Helen who also kept alive the family histories - including that saloon owner's poor opinion of her marital future. Around 1980, Helen Comstock sat in her garden on a summer's day and made a 110-minute oral history that is presented here exactly as it was recorded, but divided into seventeen parts. Videotaped on early VHS equipment, the quality of the tape is not up to today's standards, and the camerawork is poor, to say the least. (The names of the cameraman and interviewer - called "Susan" at one point - are currently not known.) The interview sometimes lurches awkwardly between decades, and suggestions are made in the text below when particular segments should be viewed in a different order. Still, it's a unique historical document, and thanks to the family, we have a quality digital transfer of the video. Much of the supplimentary comment below is drawn from Helen's own autobiographical sketch, "Rambling Reminiscences" and the memories of Martha Comstock Keegan. Some specifics are also taken from "The Finleys of early Sonoma County, California" by Carmen Finley and other sources as specified. CLICK on any video once it is playing to view it at full resolution in YouTube. 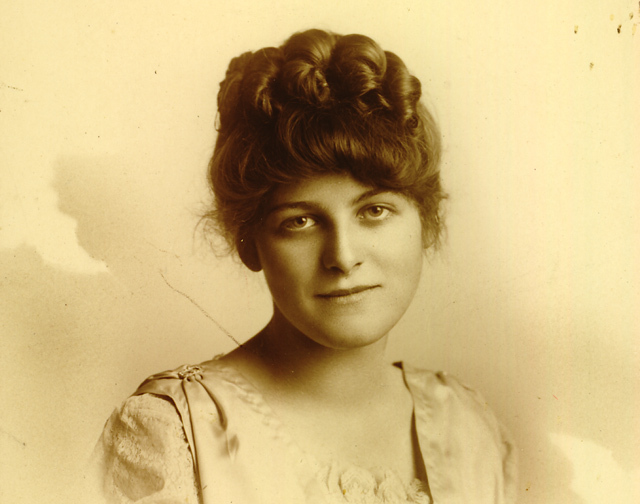 Helen Alice Finley was born in a little cottage on the banks of Mark West Creek on January 16, 1899, one of seven children to Alice and Wilson Finley. "It was a beautiful site surrounded by large old walnut and apricot trees," she wrote in 1970. "In those early days Mark West Creek flowed all summer and was a wide swift torrent in winter. From our windows high on the bank we watched great trees and often small sheds and buildings rush by." It was a life typical of rural, turn of the century America; water hand-pumped from a well, wood stoves for heat and cooking, a woodpile between the home and the outhouse (to encourage everyone to bring back something for the kitchen woodbox), and baths on Saturday night. Highlights of this section of the video include saving her baby brother's life and playing in the old graveyard where Mark West was buried. Helen recalls Mark West School, the one-room schoolhouse that her father and his sisters had also attended. Not mentioned at all on the tape was the 1906 earthquake, which happened when she was six years old. She did write about the experience: "We thought our little brother Mervyn was pulling down things in the pantry and cried, 'Mama, make him stop.' After the earthquake Grandpa's orange grove resembled a revival encampment - many acquaintances and relations arrived from San Francisco and stayed all summer - Dad and the hired men put up tents for them in the orange grove but Grandma and the girls had to do the cooking. Grandma was a very hospitable person but I remember a little grumbling about some of the ladies being lazy." Helen tells about the time her Uncle Charlie came down from Geyserville in his new Oldsmobile and picked up her and sister Frances at school, giving them a bumpy and noisy ride home. The other tale in this section describes a family trip to Calistoga, where there was an encounter with an automobile on a steep road. 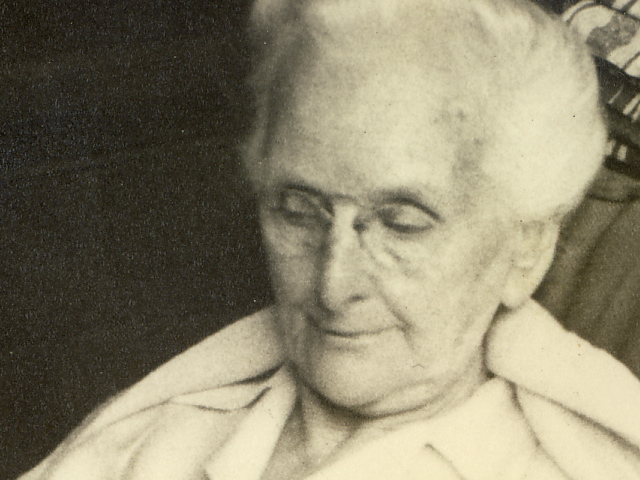 In Helen's recollection, their horses, Buck and Kaiser, were panicked by the car, and the children were hustled out of wagon as her father tried to calm the horses while the other adults clutched the wagon in fear. When they were able to continue their journey, Helen was dismayed that her grandmother had crushed her prized straw hat while she was gripping the wagon. But a newspaper item about the incident reveals a different, far more frightening version of what happened - see the discussion in our companion history blog for details. The tragic deaths of brothers Mervin and Fred are remembered, but most of this clip concerns another wagon trip to Calistoga with another bad scare for young Helen. This time the family was traveling on a cold and rainy winter night when they found the road impassable because a great tree had fallen. Her father unhitched the horses and rode Kaiser to his brothers' place six miles away, but not before breaking apart an old picket fence to build a fire for his wife and children, and tying the horse Buck to a tree far from the family - Buck hated females, it seems. Papa finally returned with her uncles armed with saws and axes to tackle the tree, but the children were frightened, calmed by their mother with little nips from the baby's bottle. The story became a Finley family legend. Helen and sister Frances adored their mother, and were upset when a newspaper feature dubbed a pre-WWI celebrity as the most beautiful woman in world, because that honor surely went to their mom. Remarkably, Helen still accurately remembered the name of Gaby Deslys. Most of the 52-acre Wilson Finley ranch was a prune orchard, but farm life mostly revolved around hops, and in the video Helen details how they were grown, with Japanese workers planting and training the vines up high poles and Chinese laborers hired to keep the arbor-like fields clear of weeds. Sonoma County boasted of being the hops capitol of America because the water-intensive crop grew readily in the loamy soil of the Russian River valley. Hops were almost foolproof to grow, but there was significant risk in making a good profit because the market prices could fluxuate 100% or more in a week; the lowest price around the turn of the century was 6¢ a pound, the highest $1.25. When Helen's grandfather died, he had two years' worth of hops in his barn, waiting for the market to improve. 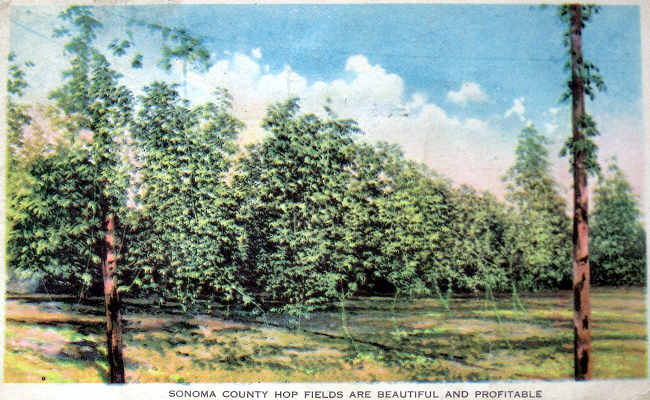 Hops season brought a flood of migrant workers into Sonoma County (an August 25, 1908 Press Democrat item noted that a "Hop Pickers' Special" train bound for Ukiah had passed through Santa Rosa with 400 passengers) and the Finleys hired many. "When hop-picking time was over Grandpa drove alone in his buggy to the Exchange Bank and carried home bags of gold and silver coins with which to pay the pickers. No one in those days [was] paid by check," Helen wrote. That army-sized labor force boosted the local economy, but also brought an uptick in crime. Santa Rosa police in 1904 warned residents to take precautions because of "bad characters who are at present in this vicinity...many there are who are flocking here under the guise of hop picking, but would rather pick pockets." Although Helen's mother only had a third grade education, she was determined that her daughters would become teachers. Both Helen and her sister Frances were sent to California State Normal School, although it was a financial hardship on the family because hops prices were at historic lows. The young women graduated from the teacher's college (which later evolved into San Jose State University) two years later thanks to the perserverance of their mother, who sent a weekly box of food to supplement their $40/month allowance from grandfather. Helen skips over her high school years in the video, but wrote that she and sister Frances drove a buggy from home to school on Humboldt Street, 4½ miles, each way. "In those days the drive from our home to Santa Rosa was a pretty drive along tree-lined dirt roads until about 1915, when concrete was laid on Old Redwood [Highway]. That winter was dreadful. We drove through deep mud to Coffey Lane, then to what is now Steele Lane and by much detouring finally arrived - rarely but sometimes late." Hilliard proposed while Helen was still at the teacher's college, with the plan that they wouldn't marry until he returned from WWI. In this segment, Helen describes her short engagement and marriage to Hilliard on July 20, 1918. As a Captain in Company E, 5th Infantry, California National Guard, Hilliard had already lead his troops in the Pancho Villa Expedition of 1916-1917. Under presidential order, National Guard forces from across the U.S. were called to the Southwest to defend the border from Mexican revolutionaries. There was little actual combat, but it was a valuable training exercise for the National Guard before troops were pressed into Federal Service for the World War. Hilliard and Company E were called into active service in March, 1917, training in Fort Sill, Oklahoma, then ordered to Camp Kearny in San Diego, where he was made a machine gun instructor ("Divisional Instructor of automatic arms"). That summer he asked Helen to join him and get married, because he had at least six months before he would be sent overseas. But when she arrived, Hillard glumly told her that he was now expecting orders to be sent to the war any day. They married anyway, having a weekend honeymoon in Del Mar and a few more days before he boarded a ship for France in August, 1918. Promoted to Army Major, Hilliard was commander of the 2nd Battalion, 120th Infantry, 30th Division, where he trained machine-gunners during the Second Battle of the Somme. He was at the front but not in combat, although at one point Helen was told he had been killed. The war ended a few months later and in the spring he was given the opportunity to spend a semester at the English university of his choice, if he wished. 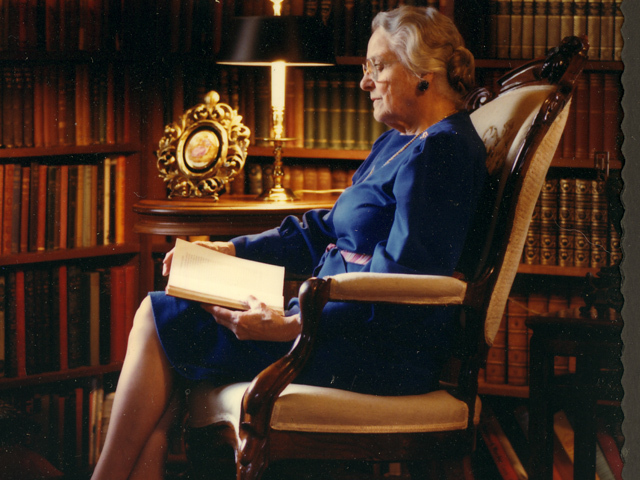 As Helen was still teaching, he spent a semester studying international law at Oriel College, part of Oxford University, where he also played on the tennis team. In this entertaining segment, Helen recalls teaching 1918-1919 at a one-room schoolhouse while Hilliard was in the Army. After graduating from Normal School in San Jose, sister Frances took a job teaching at a little school, grades 1-8, about three miles from the Finley farm. On the tape, Helen said that the forty pupils were "a rough bunch." That's an understatement; the little hoodlums had driven out the teacher before Frances, whipping the poor woman as they chased her down the nearby railroad tracks. It took about six weeks of their antics before Frances was "about to have nervous breakdown," so it was decided that Helen would take over for the remainder of the school year. She likewise faced a rebellion, but was able to enforce discipline in the classroom, and soon the kids came to adore her. Helen also relates a heart-warming Christmas story about how the children learned to have compassion for others. A year and a day since their marriage, Helen and Hilliard at last were reunited on July 21, 1919, she traveling to meet him at his old hometown of Evanston. After a honeymoon touring the East Coast, she recalls "[we] came home to this house - and his mother." Helen recalls a bit about James Wyatt Oates, Hilliard's mentor and the original owner of the home that would become known as Comstock House. Oates, she says, "hot-headily shot a man whom he said insulted his sister, but he didn't kill him. [H]e thought he had killed the man and he fled from Alabama. [He] came out to San Francisco and later found that the man had recovered." This was apparently the version that Oates told the Comstocks and others outside of Alabama. From a biography of Oates' brother, we know that Oates did kill the man in a fit of anger when he was sixteen. Coaxed by his brother to return from his sanctuary with relatives in South Carolina, Oates was placed on trial and acquitted by a jury, but only after his brother paid a "considerable sum of money" to the prosecutor - who happened to be the father of the murdered victim. 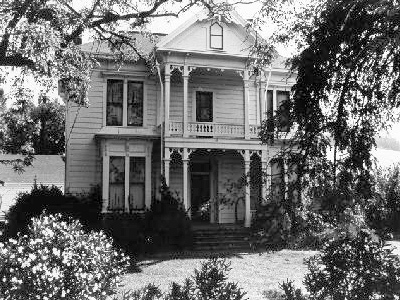 The Comstocks first came to Santa Rosa in 1907, Helen says, when Hilliard's mother, Nellie, and brother John visited Luther Burbank. The following year the family moved into a little farmhouse on Hoen Avenue. At some point Hilliard began reading law under Oates' guidance, and became his law partner in 1912. During the winter of 1915 a storm washed out the bridge on Matanzas creek, making it difficult or impossible for the Comstocks to remain at their farmhouse. Nellie and a daughter retreated to the Claremont Hotel in Berkeley, and Oates invited Hilliard to stay at his house. Mrs. Oates had died the previous year, and he was alone except for a 34 year-old housekeeper named Annie Baagoe (who had previously worked for Dr. Cline and his family). Oates died suddenly that December, leaving no heirs. Nellie and Hilliard's sister, Catherine, immediately moved into the house as unpaid caretakers until it was sold by probate the following year. Sealed bids were offered and Nellie Comstock's was the highest, at $10,000 - the nearest competing bid was $7,500. The story of Helen and Hilliard's first meeting is introduced with her account of the 1908 arson fires that destroyed her family's barn and the barn of a neighbor. This incident is discussed in depth at the companion history blog. In 1912, their neighbor held a dance in his newly-built barn, where Hilliard always said he spotted the pretty little girl with "red cheeks and curls up on top of her head" and asked her to dance. According to him, 13 year-old Helen stuck a finger in her mouth and replied, "I don't rag, thank you." Part 2 of this segment starts with a 1916 phone call to the Finley home. Donald Geary wanted to call on Frances and bring along his friend Hilliard, who was also in the National Guard. "I wasn't much impressed," Helen recalls. A dance at the Saturday Afternoon Club followed, then a picnic at the Petrified Forest. "That's when it all began - it went kind of fast from there...we really didn't have many dates before we were married. Most of our courting was by mail." Most of this segment concerns Hilliard's eldest brother, John Adams Comstock. Helen recalls that he "made beautiful jewelry," authored the definitive text on butterflies in California, and compiled an extensive genealogy of the Comstock side of his family. He obtained a medical degree and became a surgeon, authored over 200 scientific papers, and finished his career as the Chief Curator of Natural Sciences at the Los Angeles museum. 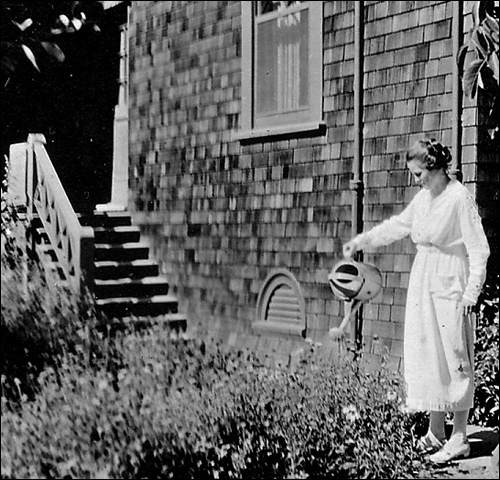 Helen might not have known that John and his sister, Catherine, were also significant players in the Arts & Crafts movement in the United States, first working at the pioneering Roycroft Workshops in New York, then continuing their award-winning craftsmanship in California, while opening Santa Rosa's first art gallery. 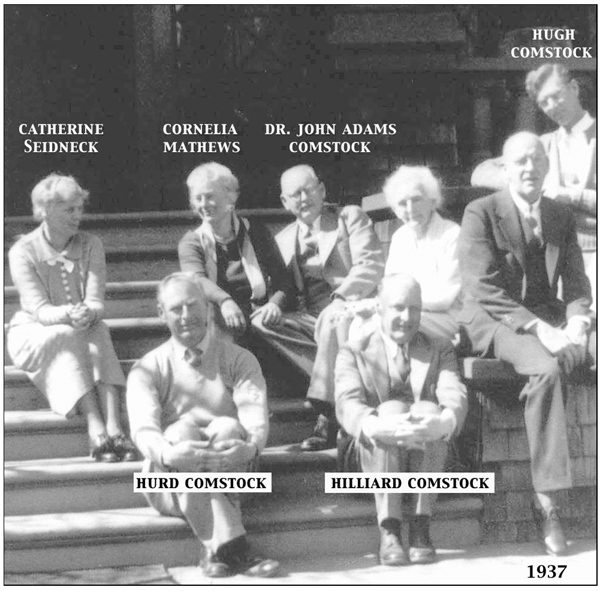 Following John's divorce from his first wife, his son, John Sterling Comstock, was sent to live with his grandmother at Comstock House for several months around 1920. Almost nine months to the day after Hilliard was discharged from the service, Helen gave birth to their first son, James, in the south bedroom of Comstock House. The other children were born at maternity hospitals with anesthetic at the insistence of their "modern" doctor. Both Hilliard and Helen came from families of seven, and she says, "I wanted seven, but by the time I had five I was 30 years old, and I decided that was enough." Margaret followed in 1922, then Marshall (1923), Harrison (1926), and Martha (1929). On December 7, 1941, Helen and Hilliard happened to be in San Jose helping friends prepare a party when news came that the Japanese had bombed Pearl Harbor. The party was cut short and the Comstocks drove home, where their children were being minded by a babysitter. "We were the last car over the [Golden Gate] Bridge before they closed the bridge that night," she remembers. Hilliard tried to reinlist, hoping the military could use him as a Judge Advocate or similar, but at 51, he was considered too old. He might also have been an effective marksmanship instructor; he maintained his rifle and pistol skills in civilian life, and won trophies at national and local competitions into the 1950s. Helen recalls that she had about eight frames of shooting medals in the library. In the section also Helen describes the WWII service of her sons. This section of the video concerns the Hilliard Comstock family when they lived on Spring Street, 1925-1940, which is described with more detail in part 17. Helen remembers the Great Depression as a challenging time, but not one of personal hardship. Hilliard had been appointed to the Superior Court in 1929, and the family was affluent enough to afford to pay $45 a month for a young woman to live with them and help with the children and chores. "We didn't have much either, but we shared," Helen recalls. People in the neighborhood were very close during those years; a husband might drop by their house after work, and Helen would telephone his wife to invite their family to join the Comstocks for supper. 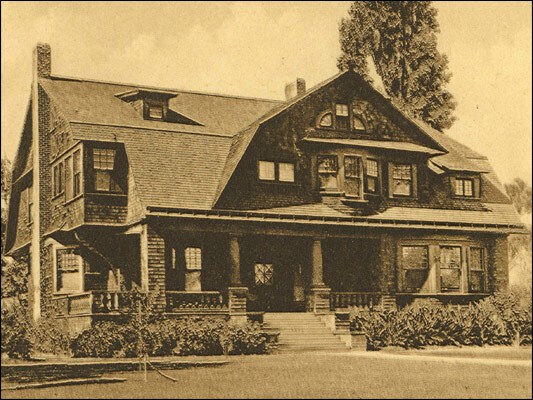 When families moved, playmates would move in with the Comstocks while finishing a school year. Although it's not mentioned by Helen during this interview, an event during the Depression brought Hilliard widespread admiration and a measure of celebrity. In 1933, there was great national concern over the alarming number of farm foreclosures. In March the California legislature rushed through the first in a series of short-term moratoriums against new foreclosures, and in June, FDR signed the Emergency Farm Mortgage Act to help farmers refinance loans. Neither were in time to help an elderly Forestville farmer whose home and orchards were to be auctioned on the county courthouse steps on July 14, 1933. The Press Democrat joined farm-relief activists to bring attention to the plight of farmer James L. Case, and the Governor personally appealed to the Sebastopol bank to halt proceedings. As thousands of angry farm advocates from throughout the Bay Area gathered to watch Case's farm be sold at auction, cheers rippled through the crowd when it was suddenly announced that Judge Comstock had issued an injunction blocking the sale. The unexpected good news made headlines, and the Oakland Tribune and other California newspapers printed a photo of Case and Hilliard together in the judge's chambers. After Helen relates the story of a barkeep telling her father that the Comstocks were "too damn aristocratic," she reflects on her parent's families. Both were "sturdy" and hard-working pioneer stock. The Finleys were well-educated, and the Hudsons were "backwoods people." Helen's grandfather, Harrison Finley, left Missouri in 1860 with an ox-drawn wagon that would take four months to reach California. He married Livonia who gave birth to ten children, although their firstborn, a girl named "Missouri," died in infancy. After farming in Contra Costa County for a quarter century, the family bought the ranch on Mark West Springs Road in 1888. Helen's other grandfather, Cornelius Hudson, was a tenant farmer in Knights Valley. Lavina (Butler) Hudson was 17 when she gave birth to her first child, Alice. In 1895, Helen's father, Wilson Ebenezer Finley, married 20 year-old Alice X, Hudson. Helen and Hilliard lived with his mother for the first three years of their marriage. 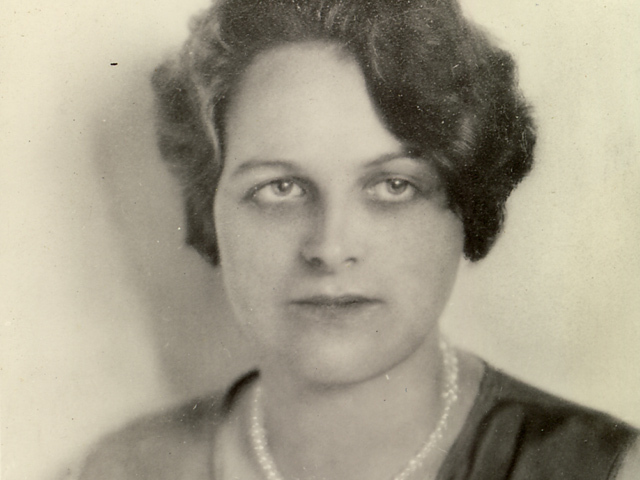 "My mother-in-law was a brilliant woman, but she was tyrannical - in a very sweet way," Helen recalls. Little that she did was to Nellie's satisfaction; she was told that she picked the wrong flowers, used the wrong containers, and even stirred the gravy the wrong way. This seemingly cold woman with a powerful intellect was in sharp contrast to her beautiful, loving mother whose education ended in the third grade. The arrangement was probably equally unpleasant for Nellie, however. Helen was only six years younger than her last child and she apparently saw Helen as another child she was being tasked to educate in the fine art of becoming a Comstock. In this segment Helen tells the 1921 story of "Charlie, the Chinese cook" whom Nellie annoyed so much that he chased her out of the kitchen with a butcher knife. His real name was Wong Don (1920 census) or Hong Dun (1910 census), and he was born in China c. 1875, emigrating to the U.S. in the late 1880s. Following her failed attempt to teach Helen how to correctly stir gravy, Nellie next hired a Filipino man, who additionally served as her driver. Helen's final tale is set in 1923, when she had two children and another on the way. Nellie wanted to visit her sister in La Jolla. Before leaving on the two week vacation with Hilliard, Nellie left Helen detailed written instructions on how to perform even the most menial chores, such as how to check the mailbox for mail. Soon after the Comstocks left, Helen took her children and walked backed to her family home on Mark West Creek. "I didn't come in and pick up the mail and I didn't water the garden and I didn't come near this place for two weeks," she says. When the Comstocks returned, they found the grass dry, letters piled up, and Helen defiant about not returning to Nellie's household. Hilliard finally asked point-blank if she intended to leave him. "No, Hilliard," she answered, "I'm leaving your mother." A deal was finally negotiated between the two women. Hilliard and Helen would build their own home somewhere in town, and meanwhile live at Comstock House. Nellie was banished to Winters, where she stayed with her youngest son Hugh. "She didn't forgive me for about a year," Helen recalls. The Hilliard Comstock family built their new home about a mile away, at 1102 Spring Street. For a family that seemed headed towards seven children, the original house could be considered small; one bedroom for the boys, one for the girls (and shared with the live-in help), plus a bedroom for mom and dad with a small nursery room attached. One bathroom. Hilliard made the attic into an impromptu target practice range. Here the family enjoyed sixteen happy years. When Nellie died in 1940, her home was left to Hilliard - but only under the condition that he and his family live there. Reluctantly, Helen moved back into the house she had once so hated. "It was the first time I ever saw my mother cry," Martha Keegan remembers. But the house was transformed by Helen's return. Nellie had kept the curtains closed, in the Victorian fashion; Helen welcomed in the sunlight. Nellie asked her grandchildren to play quietly; now the tall rooms were filled with the happy racket of Helen's kids and their friends. A rose garden emerged from a backyard of brambles along with a majestic fig tree. The kitchen was remodeled and made useable while Hilliard created another shooting range in the attic. Life now flowed through that house like a river's torrent. And in time, her bitter memories faded (but were never forgotten), and Comstock House entered its second era of glory as Helen Comstock came to embrace it as her own beloved home. Helen Finley Comstock died July 17, 1988, at the age of 89.